This tree is deciduous so it will lose all its leaves in autumn, then fresh new foliage appears again each spring. Broadly columnar tree with blue-green, pinnate leaves that turn rich red in autumn. In late spring the tree is covered with clusters of white flowers followed by pink berries that last well into winter. An excellent tree for a small garden. Garden care: Requires minimal pruning. Remove any broken, diseased or crossing branches in late autumn or winter. When planting incorporate lots of well-rotted garden compost in the planting hole and stake firmly. Does this tree have shallow roots, or deep ones? I am thinking about it for a border with other plants and shrubs. If its roots are shallow, it's not going to work. Hello there The rootstock for this tree is Sorbus aucuparia, so the roots are neither deep or shallow growing but they will spread, but I am wondering if this is the right tree for a mixed border as this a tree has quite large leaves, and a broad canopy so it will cast shade over your other plants. 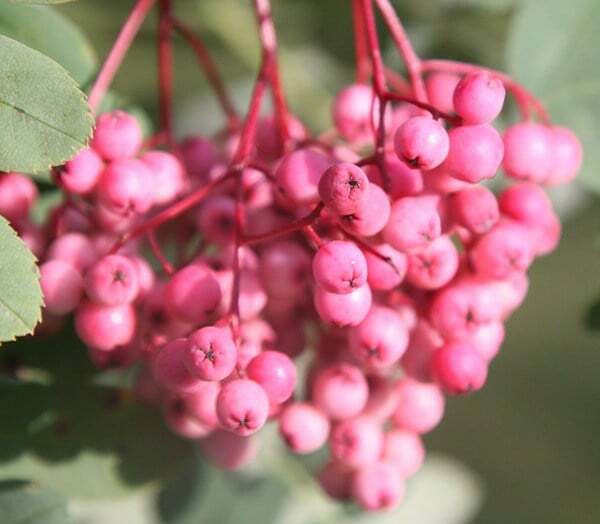 You might be better with something like Sorbus vilmorinii which is more delicate and has an upright habit with pink berries. I have attached the link below. http://www.crocus.co.uk/plants/_/sorbus-vilmorinii/classid.4742/ Hope this helps. Could you tell me approx how fast this tree grows? I would like a tree that grows relatively quickly to replace a tree that has died. This tree comes under the quick growing section but the information states that the rate of growth is average. Also, does it retain its leaves all year round?